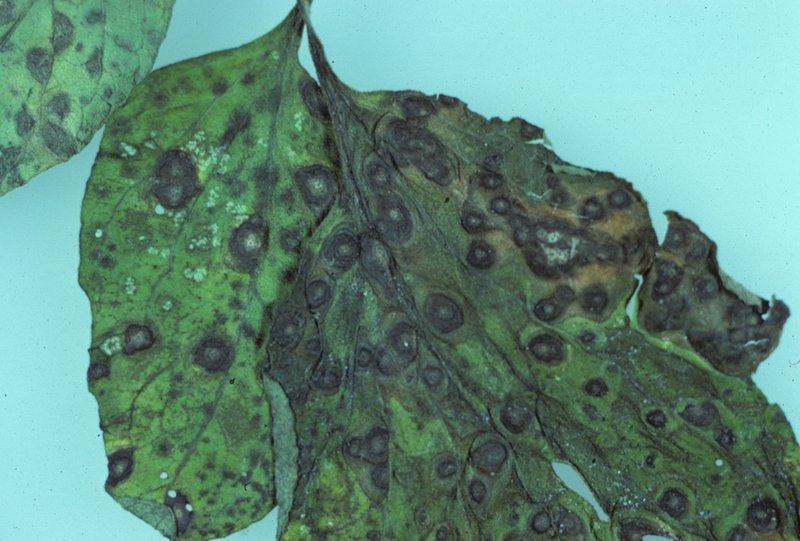 Septoria leaf spot caused by Septoria lycopersici is one of the most destructive diseases of tomato foliage. It is widely distributed throughout the world and is most severe where wet, humid weather periods persist for extended periods. All tomato cultivars are susceptible to Septoria and must be treated with registered protective fungicide sprays at regular intervals. Septoria leaf spot usually appears on lower leaves after the first fruit develops. Lesions are small, circular, with dark brown to purple borders and tan to gray centers. Black pycnidia (fruiting bodies) within lesions are visible with a hand lens. If many leaf lesions develop on a leaf, it may turn yellow, then brown, and wither. Fruit infection is rare. S. lycopersici overwinters in infected crop or solanaceous weed hosts debris. The pathogen can also survive on stakes and cages and be carried in seed. Once introduced, conidia are spread by splashing water, workers and equipment working when foliage is wet, and insects. Use resistant or tolerant cultivars. Start with disease-free seed and transplants. Control susceptible weeds (ie horsenettle) and eliminate volunteer plants and cull piles. Plow under plant debris after harvest. Fertilize properly and keep plants growing vigorously. Rotate out of tomatoes for two years. Careful attention to the timing of irrigation (avoid late afternoon or evening) and proper plant spacing to reduce the amount of time during which the plants remain wet can reduce disease spread. Stake plants to improve air circulation and reduce the contact of the plant with soil. Avoid working the plants when they are wet. Spray regularly with fungicides. Spray applications should be scheduled by spore trapping or forecasting systems (TOM-CAST) to be most effective. Early season applications often fail to control secondary spread of the disease.